Have you heard of kelp jerky? You may see it in your grocery store soon. My Green Marketplace would like to make a shout out to the company Akua which is currently undergoing a crowdfunding campaign to bring its environmentally friendly kelp jerky to the market. They have already raised more than double of their initial fundraising goal of $25,000 and appear poised to begin formal production. The jerky is made from ocean grown kelp which apparently is a superfood that has been in existence for years. (Who knew?) Its production doesn’t require any freshwater, fertilizer, or dry land, and unlike beef products will not contribute to the large amount of methane being pumped into the atmosphere. (Google cow flatulence for more information on that.) 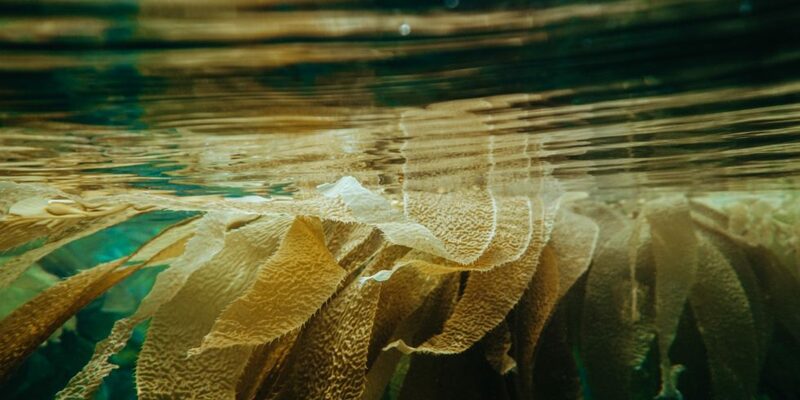 They never harvest from wild kelp fields, and claim that kelp pulls 5X more carbon from water than land plants do from air. As of now there are three flavors – Sea Salt & Sesame, Turmeric & Coconut, and Rosemary BBQ. But if you donate $3,000 or more they will allow you to participate in the creation of a fourth. Or, if you donate $1,500 you can decide which staff member will have to get a ‘seaweed art’ tattoo. According to Akua, the jerky is filled with vitamins, minerals, phytonutrients, amino acids, omega-3 fats, and even fiber. It also expands in your stomach to make you feel more full, and supports your body’s ability to absorb water. A serving contains about 8 grams of protein, and unlike many protein bars is very low in sugar. Next on the agenda for Akua if the kelp jerky takes off: kelp burgers, kelp sausages, kelp broth, kelp noodles, and kelp dressings. So if you are looking for a new healthy snack, keep your eye out for some high protein fruit of the sea. Stay tuned to see if we can add Akua kelp jerky to our list of products here at My Green Marketplace. Or, if you have a great product that you think we should sell reach out to us. Let’s do great things together.